The Lion Rampant flag is also called the Royal Flag Scotland and the Royal Standard - having been used by Scottish Kings, with the first to have done so being Alexander II (1214-1249). It is much older than the St Andrew's flag and should now only be used by Her Majesty in her role as the Queen of Scotland. The lion on the Scottish rampant lion flag is described in heraldic terminology as rampant because it stands on one leg with its for paws raised as if to strike. The lion must face to the left as in the picture of the Scotland rampant lion below. This is because in olden days it would face forwards when on a shield worn on the left arm. The colour of the tongue and the claws is azure. It is widely used as a second national flag especially at football matches and rugby games - although permission must be sought if it is to be run up and flown from a pole or from a building. 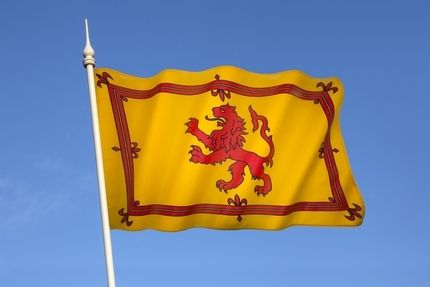 It technically remains an offence for citizens and corporate bodies to fly or wave the lion rampant flag under the 1672 Act of Parliament because it is not a national flag. However the law is much more relaxed in modern times. This can be traced back to when King George V gave permission to his subjects in the year 1935 to wave ones during celebrations of his silver jubilee. Since then people have seen the practice of carrying and waving them as acceptable and they continue to be proudly waved and carried during national sporting events such as football and rugby. However a special department, The Court of the Lord Lyon, who are the authority on heraldry in Scotland, are responsible for legal matters relating to the lion rampant flag and matters of Scottish genealogy and state ceremonial duties. The Court of the Lord Lyon still prevent people and organisations flying it from flagpoles. Exceptions are made if other national flags are flown or if it is part of the decor with others. When representing the sovereign Great Officers of State will use the Royal Standard. Examples of the use of the Scottish lion flag on these occasions include the First Minister as Keeper of the Great Seal and the Lord Lyon King of Arms. DC Thomson, the publishers of Scotland's favourite Sunday newspaper The Sunday Post, was given special dispensation by the Lord Lyon to fly the lion rampant flag from its headquarters in Meadowside Dundee in the 1920s. See also the Scottish Saltire St Andrews National Flag Scotland and the Scottish Thistle - National Emblem of Scotland pages.